Air India Limited Notification is out. 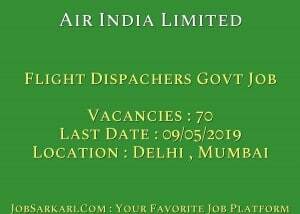 Air India Limited is recruiting for 70 Flight Dispatchers Govt Job Posts. You can check Air India Limited - Air India Limited last date, download Air India Limited notification, visit Air India Limited official website and check other Air India Limited Vacancy details.Complete Vacancy and recruitment Details about 70 Flight Dispatchers Govt Job vacancies in Air India Limited are provided below by JobSarkari.Com only for you. Date of Interview. 06/05/2019 And 09/05/2019 between 10:30 AM. to 12:30 PM. Flight Dispatchers. 30. 18. 07. 10. 05. 70. Candidate Must Have Passed Class 12th or Its Equivalent with Physics and Mathematics. Sr. Trainee Flight Dispatcher And Trainee Flight Dispatcher. 62 Years. Junior Trainee Flight Dispatcher. 35 Years. Age Relaxation. 3 Years For OBC And 5 Years SC/ ST.
2. Candidate Are Required to Download Application Form As Given on our Website in Important Section. 3. Candidate Have to Fill All the Details in Application Form And Need to Attach All Mandatory Documents And Passport Size Photos. 4. Candidate Have to Go on Given Address on Given Dates. Venue : O/o Executive Director (Operations), Air India Limited, Headquarters Near Jorbagh Metro Station, Safdarjung Airport New Delhi-110003. on 06th May 2019. Venue : O/o In-Charge Flight Dispatch Operations Department, Air India Limited Corporate Bldg-04 Old Airport, Santa Cruz-E Mumbai- 400029. on 09th May 2019. Q. What is the Last Date For Air India Limited Flight Dispatchers Govt Job Vacancy ? A. 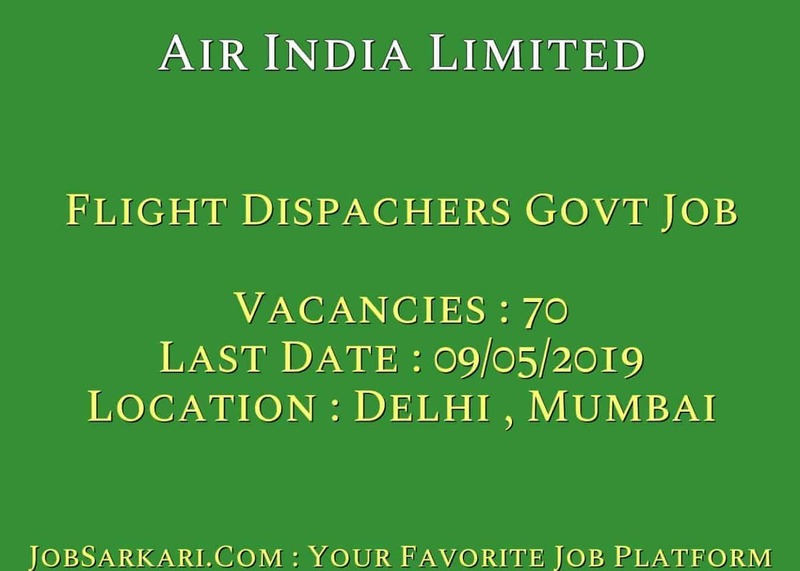 Last Date for Air India Limited Flight Dispatchers Govt Job Posts is 09/05/2019. Q. What is the Form Type of Air India Limited Flight Dispatchers Govt Job Recruitment ? A. The Form Type for Air India Limited Flight Dispatchers Govt Job Posts is Offline. Q. How many vacancies are available in Air India Limited Flight Dispatchers Govt Job Posts ? A. There are about 70 Vacancies in Air India Limited Flight Dispatchers Govt Job Posts. Q. What is the Full Form of Air India Limited ? A. Full Form of Air India Limited is Air India Limited . Yes, you can apply for this post… you can download application form as given on our website in important link section. Aap is link se sabhi sarkari naukri ke liye apply kr sakte hain..
Hello sir, there is any opportunity to 12th passed in art side? hello sir i m doing bcom. final year .can i apply this job??? What work we have to do there? Sir for this job it is mandatory to have a technical qualification? Please tell me the address at which we have to send the application form after apply.